Sauras, Saoras, Savaras or even Sabris as they are called, find a mention in the Indian epics Ramayana and Mahabharata. Jara Savara is said to have killed Krishna with his arrow, in Mahabharata. In a Saura painting the border is drawn first, after which the interiors are filled, this is called the fish-net approach. Originally created on the inner walls of the Saora houses, these paintings or 'italons' were meant to appease the presiding deity, 'Edital' and deceased ancestors, and for superstitious purposes such as averting disease, preserve good harvest. There is almost always, a house in an 'italon' or 'ittalan', that is, a Saura painting. Browse some Saura paintings here. 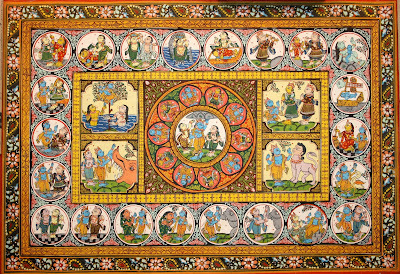 Pattachitra is the pioneer/earliest indigenous painting style of Orissa (said to date back to the pre-historic times). 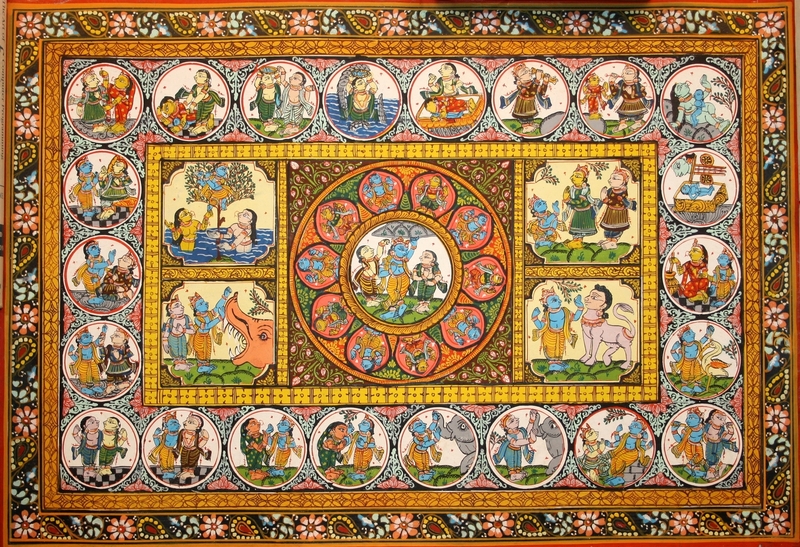 Earlier, a Pattachitra chitrakar (artists) abstained from women and liquor until he completed his painting. It was dying for want of patronage by the 1950s, when Halina Zaely, a Polish-American lady resuscitated it by supporting the artists. Interestingly, the chitrakar essentially begins painting his pattachitra with white colour and ends with white too...eyeballs of the figures being the last to be painted. Even now, the finer brushes used by these chitrakaras are made with 5-6 mouse hair each. A painting from a rustic in Madhubani, or the necklace made with seeds. A camel made in bell metal, or a moonscape of rice straw...Yes, there's story in it all! Stories we never get told. Stories, that awe one and all...stories we'd love to bring you. Yes, we bring you the stories, and of course, the art. "Is this it? ", you may ask. "Well, there's more." we would like to say. What better than art then, to lose ourselves in, and to find ourselves--art straight out of the heart of its creator; art that brings respite to our tired souls, art that is always like a friend that keeps us company, comforts and inspires us...and very subtly blends in with our thoughts, our being when need be. Let us then, take you along various 'walks of art' and share with you, a feeling of happiness...a sense of well being, that comes essentially, from a subtle wisdom, a deep seated appreciation for these works of immense creativity, that we bring your way and of course, the stories behind them all, that we all love to hear! Let's get a little closer to the people that make all this difference to our worlds. To hear the fascinating stories behind those gorgeous works of art--the windows that let us in on the world of magic. 'Walks of art'--a very human way of making life more bearable, a way to make our souls grow, for, as Pablo Picasso put it, "Art washes away from the soul the dust of everyday life." So, check back when you may, for nuggets and more. Better still, subscribe and don't miss a thing! It's free. Artsya, serves to bridge the gap between creators of art, and its connoisseurs, through sharing with our readers, intricacies such as stories behind the origin and creation of art in its countless manifestations, from the land of immense diversity, India. We bring to our customers, not just premium quality traditional art and crafts, but also a feeling of happiness, that comes essentially, from a deep seated appreciation for these works of immense creativity, and more. Artsya is a team of individuals, like-minded in our pursuit of appreciation of art. We find pleasure in educating ourselves in matters such as traditional crafts and interacting with the artisans. We therefore, personally hand-pick the handicrafts, ensuring authenticity. The opportunities here, at Artsya, are endless for everyone, given a vast a choice of art that we help them bring into their homes, offices...their lives!